For the last year or so, the Firefly has been my portable loose-leaf vaporizer of choice—and why wouldn't it be? It's blown the competition away in terms of efficiency, portability, ease of use, and vapor quality. But with the release of Arizer's latest porta-vape offering, the Firefly's reign could be coming to an end. The Air is the latest portable vaporizer from Arizer, which previously made the beloved Solo. (I haven't tested that one yet.) At 122 mm by 29 mm, the new Air is roughly the same size as the Firefly—albeit a bit lighter and far more cylindrical. And, with a $270 price tag, it's the same price as well. Additionally, both sport swappable Li-ion batteries and last about an hour of continual use on a charge. But get this: the Air can be used while plugged in and charging. The Air uses a 5-stage ceramic heating element that gets up to its highest temperature in roughly 120 seconds. That's certainly longer than the 10-15 seconds that the Firefly requires to get up to 400 degrees F—which is ideal for taking sneaky tokes at concerts, bars, and other places where vaping is verboten—but the Air makes up for its sluggishness with a variety of temperatures ranging from 356-410 degrees F.
So while it may not heat near instantly like the Firefly, the Air gives me better control over the vaporization process, allowing me to dial in exactly how thick I want my vapor to be. Plus, the Air includes an "aroma dish" that lets it double as an herbal or essential oil diffuser—just in case you want your entire apartment to smell even more like weed. In terms of bowl capacity, both hold around half a gram of material when loosely packed. The battery and heating element are contained within the matte silver or black base unit (which looks suspiciously like Luke Skywalker's lightsaber) while users load finely ground loose-leaf into the pull-out glass mouthpiece/crucible. The straight tube design of the Air differs significantly from the Firefly, which is based more on the traditional pipe shape with an upward facing bowl and rear-facing mouthpiece. The loading process is actually really slick. With the Firefly, you have to pry off the magnetic cover, scoop out the used herb, then refill the crucible and fiddle with the cover until you get a proper seal. For the Air, you simply pull the mouthpiece out of the base, dip the bowl partition at the base of the mouthpiece into a pile of finely ground loose-leaf to pack in the herb, and push the mouthpiece back into the base unit. I especially love that you don't have to handle the ground herb when packing the bowl, which drastically lowers the chances that I'll spill half of it onto the carpet. Nor does it require specialized pick-spoon tools like dabbing does. You really only need the mouthpiece and a decent grinder. Plus, the Air comes with a pair of mouthpieces, both of which can be stored in the included carrying case, allowing you to swap between them (and effectively vape continuously) without having to wait for it to cool for a minute or two between sessions like you do with the Firefly. I mean, technically you could immediately dump and refill the Firefly after each bowl, but my experience has shown that normally results in burnt fingertips and singed herb. The vapor quality is easily on par with that of the Firefly. The lowest two settings are a bit weak for my taste but do prevent the herb from scorching—like, at all—while the highest pair of temperatures can take an interminably long time to reach (I have to wait a minute and a half to get high? Oh noes!). Best bet is to take the Goldilocks route and stick with the 392 degree F median option—it produces a milky, visible vapor that still actually tastes like the herb that you put in there, instead of tasting like burning. I do have a couple of reservations about the Air, though. For one, I'm terrified of dropping it from any appreciable height for fear of breaking the mouthpiece—same goes for transporting the unit in my pocket—or potentially damaging the 18650 Li-ion battery. Plus, the Air doesn't hold its temperature quite as well as the Firefly does—especially when you're drawing rapidly. A couple of quick huffs is usually enough to set the status light blinking for 5 to 10 seconds as the unit normalizes its temperature, though that's a problem with most every portable vaporizer I've tried. That said, using the included neoprene sleeve does help the unit better maintain its set temperature, though at the cost of looking like you've wrapped a lightsaber in a rather large condom. 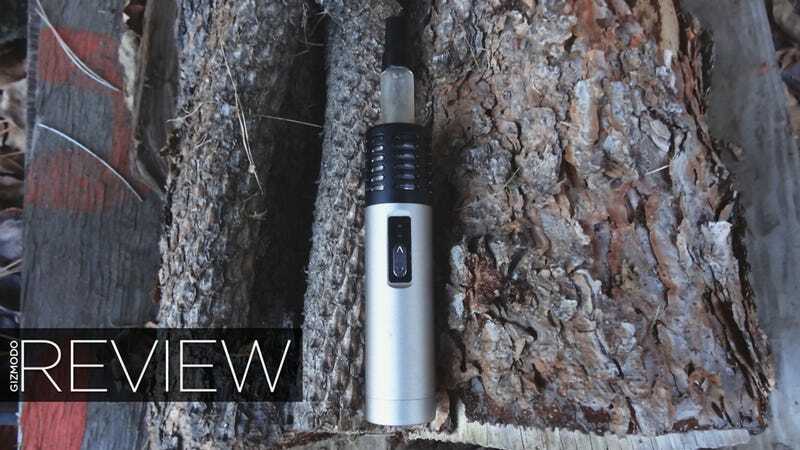 Still, this is a great—and surprisingly potent—vaporizer that performs just as well as the vaunted Firefly. And, honestly, it's a toss up between the two. If you're looking for something that hits faster and more stealthily go with the Firefly. If, on the other hand, you prefer a finer gradation of temperatures and continuous operation for extended sessions, give the Arizer Air a whirl. You can purchase the Air at TorontoVaporizer (which supplied my review sample) or directly from the Arizer website.